A lovely family cottage consisting of two double bedrooms and a small attic bedroom suitable for children. Built in the late 1890's this cottage still has many period features. It comes fully equipped to make your short stay in London a relaxing one. It has all mod cons . The cottage is situated on a very quiet road in a safe and sought after area. Our guests will have plenty of space to enjoy after a day out in London. The kitchen is fully equipped to allow our guests to make their own meals.We have a beautiful sunny garden with a table and chairs for those warm and dry nights.During the summer months the garden is the perfect place to enjoy the coffee in the morning/or to have a glass of wine before heading out. The cottage is situated in Highbury ,London. This is one of Londons's smallest areas and the postcode is much sought after by families looking for a house to either buy or rent. Our guest will find the the stunning Highbury Fields and its splendid Georgian Arhectiture a few moment from the house. This is a 15 acre open parkland that is too tempting to resist that spring or summer picnic. The cottage is close to several transport links allowing a quick journey into the heart of London.Highbury and Islington Station is on the Victoria Line on the tune/metro and will get you to Oxford St in just 4 stops. There are numerous shops restaurants and bars all within walking distance, The closest supermarket is Waitrose. There's also a small Tesco Metro on the next street over. This should have all the essentials for your stay if you don't wish to visit the larger Waitrose.I have to mention the wonderful La Fromergie cheese shop in Highbury. This shop is a pure foodie heaven(if you love cheese and wine) They often have tasting nights that are a pure delight to indulge in.You can also take the cheese away to have back at the house. A 15 minute walk away is the vibrant and rather busy Upper Street in Islington.There are so many restuarants on the street it's very difficult to choose which one to dine at. You'll find that Upper St can be as busy as the West End! There's the excellent Morgan M restaurant/a must visit if you're into fine dining. However, many of our guests choose to stay in on some nights and for this we have a LCD TV.DVD player,selection of films and games for children. There's plenty of pillows, blankets an duvets for up to six people. The living room also has a double sofa bed.Upstairs there are three double bedrooms.There's a full bathroom with a very powerful shower. My Name is James and I manage this property for a good friend of mine. I live in the area and it's a great part of town! The lovely patio garden is a great place to unwind with a glass of wine/or to eat outside during the warmer months. located in Zone Two of Central London /within easy access of all major attractions. Convenient to public transportation, breakfast cafe, take away food, plenty of space, slept well. Everyone enjoyed themselves. We were two couples and had no problems. We loved our time at Whistler. The location to the tube and shops was great. We had room to spread out. Alex was great about responding to any questions we had about the property. Nice place with plenty of beds. Alex was very helpful. 3 different Tube stations a solid 10 minute walk away. Pretty hazardous stairs for little kids but great parks close by. Thank you. I'm pleased you and your family enjoyed your stay and made use of the lovely Highbury Fields nearby. The stairs are standard for a house from that period, they would have been build originally as cottages for workmen and their families in the Victorian period.I hope to welcome you back on your next visit to the UK. A very good place, attractive and quiet area, good transport, particularly bus routes 19 & 4. House is a pretty example of Victorian architecture, decently furnished. Minor points: a couple of extra rails in the bathroom for towels and remarking the oven controls, which have worn away. Of more immediate concern, we noticed the pressure in the heating system was below 1bar and the radiator in the top bedroom is in need of bleeding, it is half full of air. Thank you.It' great to hear you enjoyed your time at the house.Thank you for pointing out rad issue, all sorted.I always encourage guests to get in contact whilst they are staying as most issues can be easily sorted. I hope you choose to stay there agin on your next visit. This is a great property. Not too far from central London, close to two tube lines and reasonably clean. Alex was very responsive prior to the visit and wonderful about showing the property features on checking in. The property itself was nothing luxurious but a great value for London. Only thing holding back from a perfect rating was the WiFi was terrible and the cable tv didn’t work. The cable was no big deal but poor WiFi that only connects when the stars align is an issue for international travelers with expensive data options. Otherwise, excellent property! Thank you, I'm so pleased you enjoyed your stay at the house. I agree that it's fantastic value for money given its location and size. I called up Virgin Media, and typically there was a fault in the area during some of your days, this would have resulted in a slow speed and issues with the TV. They have assured me this has now been totally resolved.I do hope you choose to stay again on your next visit to the UK.I'll pass on your kind comments to Alex too. I stayed here for 17 nights with my husband and four children while we were in London for our work. The cottage was cozy and comfortable and we were able to make one bathroom work. Communication was great and Alex was so helpful. Easy walk to The Victoria and Piccadilly lines as well as the overground. We loved the quiet neighborhood near an AMAZING park but also enjoyed quick and easy access to the market, cafés, etc. It was fun to hear the roar of the Arsenal crowd on match days! We caught a match ourselves. Truly a residential experience with easy access to the center (we also caught 3 West End shows). Everything was in good order and it was lovely to have a washing machine. I would recommend this property, and my children would as well! One of their favorites in the midst of four months in Europe. Thanks James and Alex! Thank you so much for your kind words. It's lovely to hear that you and your family really enjoyed the house and its location.I hope to welcome you back on your next visit. 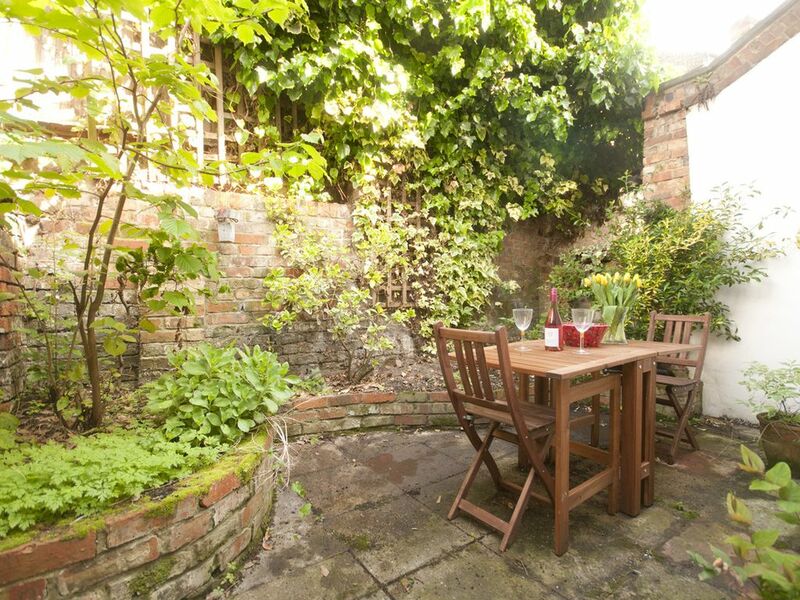 A beautifully presented cottage situated moments from Highbury Tube Station. The 7 minute walk will take you past some stunning Georgian houses and the tranquil Highbury Fields.